H.E. 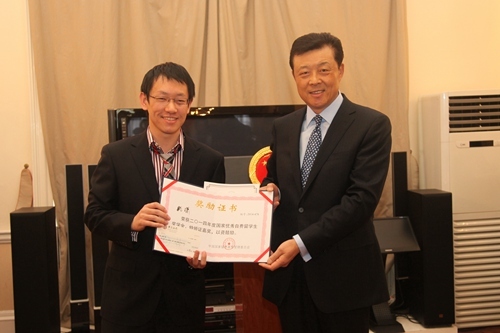 Ambassador Liu Xiaoming Attends the Award Ceremony of "Chinese Government Award for Outstanding Overseas Self-financed Students"
On 24 April 2015, H.E. 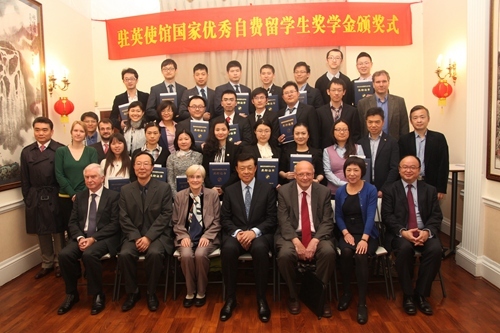 Ambassador Liu Xiaoming attended the Award Ceremony for "Chinese Government Award for Outstanding Overseas Self-financed Students" held at the Education Section of the Chinese Embassy and delivered a speech. The ceremony was chaired by Mr. Shen Yang, Minister-Counsellor of the Education Section. Over 60 people, including award-winners, their mentors and family members as well as evaluation experts, attended the award ceremony. On behalf of the Chinese Embassy in the UK, Ambassador Liu warmly congratulated the 32 winners, and thanked their mentors for the guidance and help. He said that it was a real pleasure for him to attend the annual event for the fifth time. He recalled the first award ceremony on "China's Youth Day" in 2010 and noted that during the past 5 years, 6 batches of altogether 189 Chinese students in the UK had won the award. 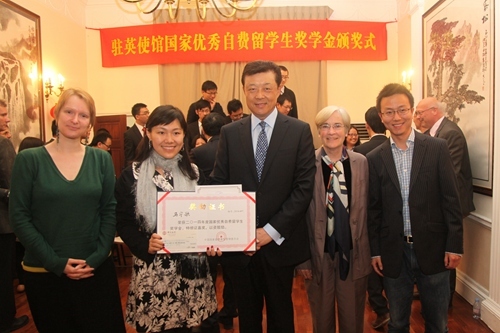 They represented the very best of China's overseas students. Ambassador Liu said that the award was a government recognition of the academic achievement of the students and encouragement for them to return to the homeland, give full play to their talents and realize their dreams. Currently, China is deepening reform, promoting rule by law and developing the economy in all aspects. As China continues to grow stronger, its influence on the international stage is expanding. The Chinese people are closer to the great rejuvenation of the Chinese nation now than at any time in history. Ambassador Liu stressed that innovation is the key to development and national rejuvenation. As President Xi Jinping pointed out, innovation is the primary driver of development. People are the critical factor in innovation and creativity. The Chinese government has been committed to making conditions available for innovation and has been vigorously encouraging grass-root start-ups and innovation. Overseas students will have bright career prospects back home by becoming the main force of innovation and entrepreneurship and by bringing out their advantages. He hoped that overseas students would become outstanding "makers" in an age of "start-ups and innovation", so as to contribute to the development and renewal of the Chinese nation! Ge Liang, Ph.D. student from the University of Manchester spoke on behalf of the award winning students. He shared his thoughts on pursuing studies, namely, having clear goals, thinking creatively and showing perseverance. He expressed gratitude to his motherland for the support and help, to his mentors for their guidance, and to his parents, relatives and friends for their care and encouragement. He said the Chinese students in the UK appreciate the care and expectations of the motherland and will work hard in their studies and research and will strive to reach for the best so as to better serve their country when they return to the motherland. On behalf of the mentors of the award winners, Professor Richard Compton from Department of Chemistry, University of Oxford gave a speech. He noted that overseas students in the UK made great contributions to scientific research at British universities, among which Chinese students were one important force. Chinese students have also promoted friendly communication and cooperation between Britain and China in the interest of both countries. Overseas students have overcome language barriers and achieved good academic results. Their diligence as well as teamwork spirit is commendable. At the ceremony, Ambassador Liu presented the certificates of award to the winners and had a group photo taken with the students, their mentors and evaluation experts.